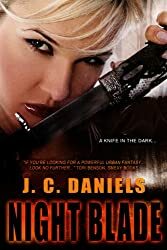 Night Blade is book two of the Colbana Files series by JC Daniels and follows Kit Colbana and her investigations. Now that Kit and Damon are officially a thing, and he’s the Alpha of the Cat Clan, Kit’s life can settle back into a normal routine. Until Justin, a Banner cop from her past, shows up with an investigation she can’t ignore. She’s got to save Damon’s life by proving that he’s killing for a good reason. But she can’t tell him why she’s investigating, or even that it’s him she’s trying to save. Secrets kept have a way of making things more difficult. Besides, Kit still must deal with the nightmares of her past, the half-human blood she can’t escape, and a new fascination from Doyle, the cat kid she saved. All this on top of her difficult relationship with the cat alpha, and his over protective instincts. Kit has to save him, or she’ll never forgive herself. But will she lose herself in the process?